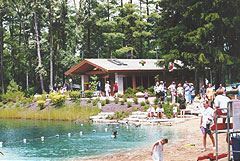 Spring Lake Park is the "heart of Lincolnshire". This park is now a beautiful lake with shallow area for small children and slide for older children. The Park is approximately 8 acres in size and provides a wide assortment of recreational opportunities including swimming beach, fishing pond, picnic area with grills, tennis court, volleyball court, playground and more.